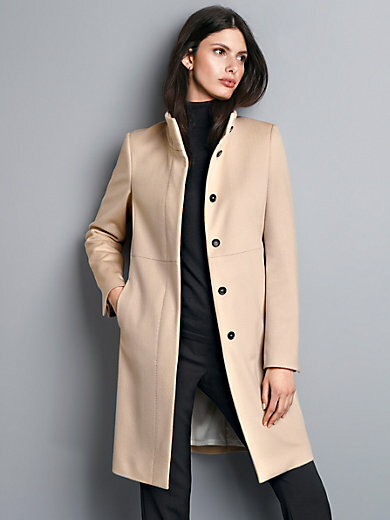 Coat by STRENESSE: masterful craftsmanship in a feminine cut, made from the finest new milled wool. Business outfit or smart everyday look? This designer coat is perfect for both! The sophisticated style impresses with subtle details such as an overlapping decorative slit at the cuffs, concealed button band, flattering raised collar, horizontal all-round panel seam and a concealed integrated walking vent at the back. 2 seam pockets. 100% new milled wool. Lining in 50% acetate, 50% viscose. Length approx. 94cm/37ins. Dry clean recommended.